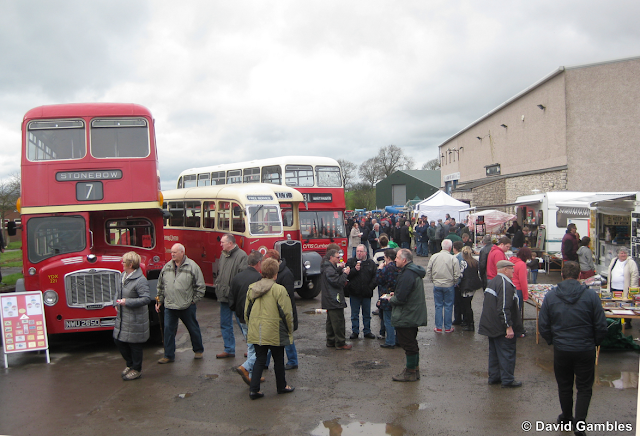 As you will have seen on the Focusflickr website, the Eden Classic Vehicle event took place over the Easter weekend. In spite of high fuel prices and a less than positive weather forecast vehicle attendance was good and visitor numbers held up quite well. Brough had its own little micro climate which was mostly cloudy with drizzle, whereas Kirkby Stephen was much brighter. As usual, exhibits were parked in Kirkby Stephen on the Market Square, along the main street and at the Auction Mart and also the Co-op car park on the Sunday. The bus service linked Brough with Kirkby Stephen and the two railway stations and was kept very busy on both days, the most unusual vehicle taking part being the Australian Albion with its remarkable double deck bodywork looking like something out of a Flash Gordon movie! The Stainmore Railway had a busy time during the two rally days with visitors hopping off the buses at the entrance to the East Station and visiting the facilities at this very active railway centre. http://www.kirkbystepheneast.co.uk/index.html The Peckett 0-6-0 was in steam and making journeys to and from the station, although rides weren't allowed this year, the intention is to introduce these as soon as the relevant legislation has been complied with. In spite of this, visitor takings were up 50% on the previous best year, so the railway was one of many organisations that benefit from this event. 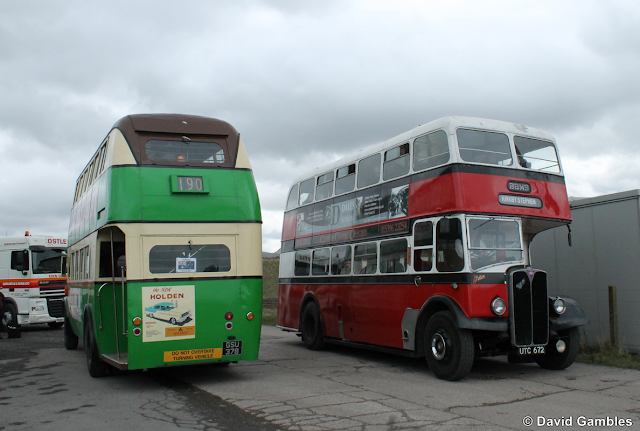 Buses also ran to the Eden Valley Railway at Warcop. This is located just a few miles down the same track as the Stainmore Railway group. Another popular diversion on the bus route was through the village of Winton where the local pub pulled out all the stops the welcome visitors with a hog roast and a good selection of beers. So, a successful event for the Eden Classic Vehicle Group and a good start to the season for vehicle owners, traders and visitors. We look forward to next years event. ex Bamber Bridge Motor Services AEC Regent meeting the Australian bodied Albion. In spite of the clouds hovering over Brough for most of the Sunday visitors still enjoyed their day andbuses were kept busy shuttling people to and from Kirkby Stephen. the main street of Kirkby Stephen adding interest to the scene.Note how, in spite of having power steering, the Range Rover driver couldn't manage to park correctly in the bay! Steve Morris always manages to bring something different each year and here we see hisSafeway Services Dennis Lancet, newly acquired from Safeway who have never restored the vehicle. Leyland Leopard PSU3/3R with 'long bay' Alexander Y type bodywork.